With hundreds of exhibitions and trade shows going on up and down the UK, it’s essential that your exhibition display makes its mark by being enticing and eye-catching. To achieve this, you need to create an exciting, contemporary design with complementary or your company colours. Working out which type of exhibition stand is suitable for you and your event is crucial, therefore it is important you are aware of the range of exhibition products available before deciding. Linked pop-up display stands are an excellent choice of exhibition stand, offering many different configurations allowing your stand to be versatile. 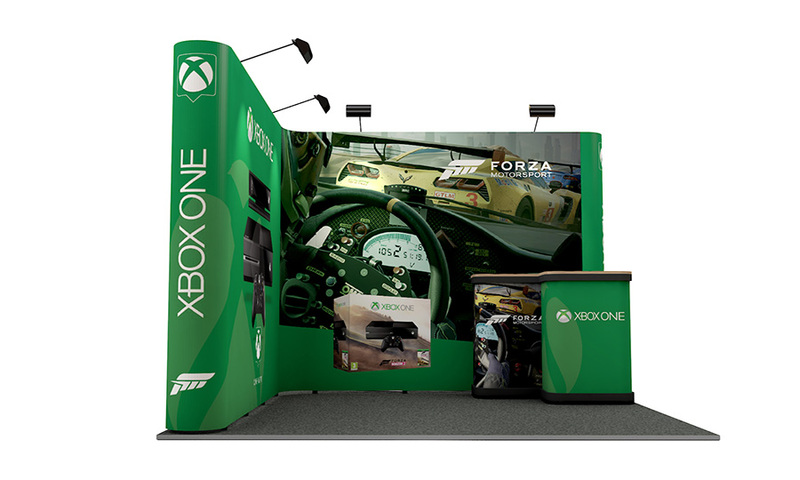 The system links multiple pop up stands together with the clever use of ghost panels giving a seamless graphic. If required, you can also purchase a double sided graphic, this allows for maximum brand awareness and a bigger graphic area for your marketing message. 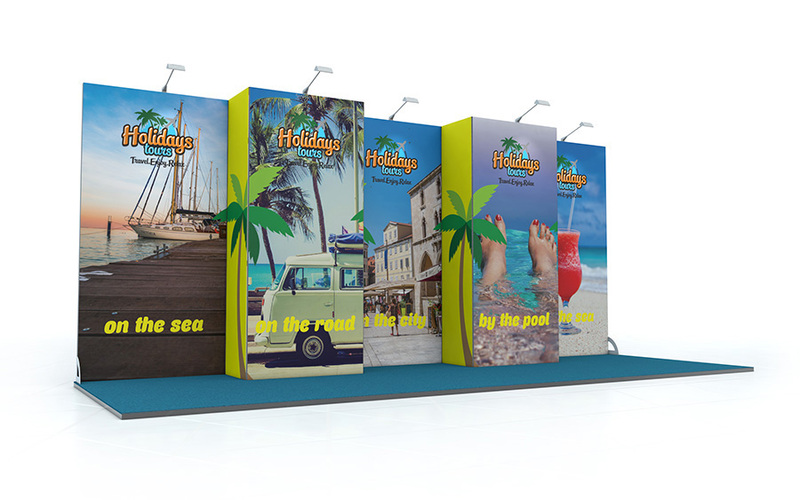 Linked pop ups are ideal for exhibition backdrops and creating a panoramic printed exhibition backdrop within your show space, they are a cost effective way of creating large scale exhibition stands. At the end of your event, you are able to collapse down the whole stand and pop it into the wheeled portable carry case provided. Nothing could be simpler. At XL Displays, we now include LED Lights as standard with all pop up stands. Providing a low cost lighting solution, these LED lights link upto two using one power cable, minimising the number of sockets and power required for exhibitions and events whilst illuminating your display. A great alternative is our traditional pop up display range. 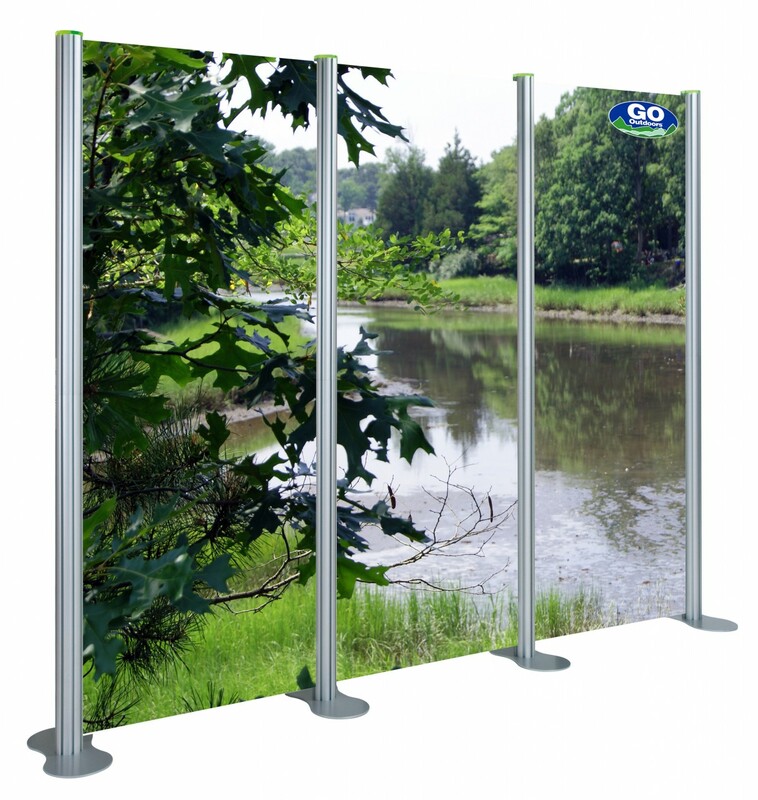 They are such a popular option because they are portable, very simple to set up and give maximum back drop coverage. 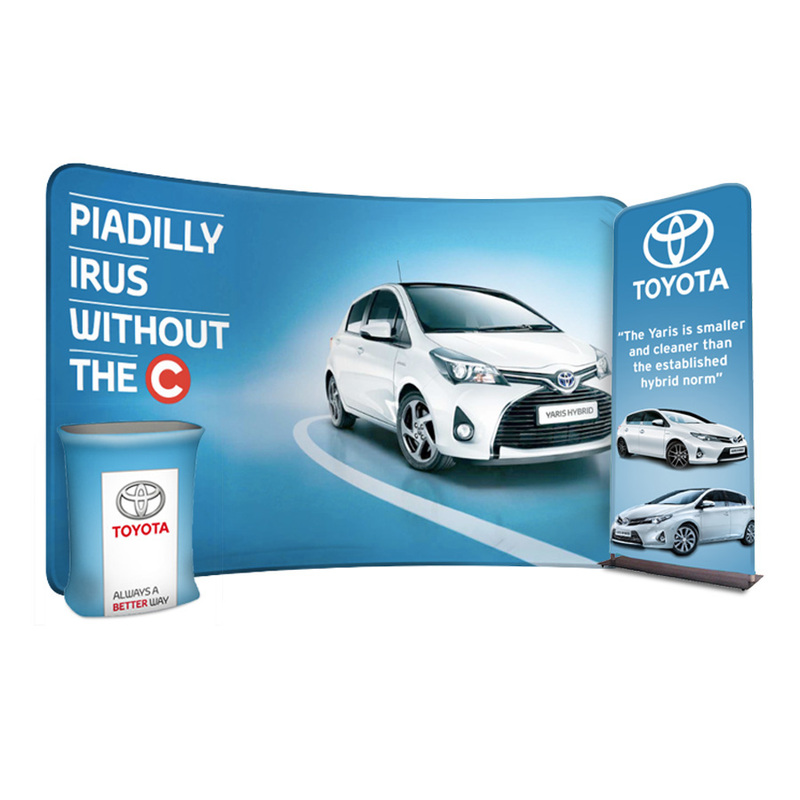 Available in a straight and curved option, our pop ups are great for maximising brand awareness and promoting your marketing message. We have a wide range of sizes available starting with a 3x1 pop up and our largest being a 3x5 pop up. Our pop up displays are dispatched within 72 hours, on receipt of print-ready artwork, with next day courier delivery. We offer an express delivery service for an extra cost if you need your pop up stand quicker, ensuring you get those vital exhibition equipment in time to display your marketing message. As for assembly, our pop up stands can be set up within 10 minutes by one person, without tools or special training. This provides a stress free and effortless assemble, so you can focus on more important aspects such as enticing visitors to your stand. The frame simply ‘pops up’ and is held together by magnetic stalks in the centre. Magnetic bars are fitted to the frame to give added strength and stability. Printed graphic panels with magnetic tape on the reverse simply attach to the frame. They create a professional and stylish exhibition stand which can be reconfigured for a different look each time. Easy to assemble, Centro has a unique RotrLink system whereby the poles and rails simply twist and lock together and are then joined to build the frame. We offer a range of standard Centro display stands in a choice of widths and styles. Allowing you to be fully flexible with your design and sizing. If you require an audio visual element to your display we offer four Centro multimedia stands which include monitor brackets to hold LCD screens. You can also purchase brackets to store and sell products from, which is ideal for retail displays or showcasing clothing at exhibitions or trade shows. Each prong arm fits easily into the grooves on the Centro slatwall. Allowing you to create a display which suits your product as the arms can be attached anywhere on the slatwall panels. There is a variety of different prongs we offer such as display leaflet holders, shelving units and a garment arm. All graphic panels for our Centro stands are printed in-house. Panels are then laminated for durability and to give tear, crease and scratch resistance. They can be rolled up for storing and transporting in the cases provided. Fabric exhibition stands offer an effective and realistic alternative to traditional PVC and vinyl display stands. Fabric displays are a unique display system which will help you stand out at your next exhibition. Our portable fabric displays are available with a range of hardware systems. Formulate is our widest range with straight and curved stands, hanging displays, arches, counters and meeting pods. Hop Ups are perhaps our easiest fabric stand to use where the graphic stays attached to the frame which simply pops up and stretches the graphic into place. We also supply SEG fabric displays which combine the ease of a pop up frame with the style of a fabric graphic panel. All of our fabric displays are manufactured and printed in the UK. Fabric is printed in full colour using a dye-sublimation process where heat and pressure transfer dye into fabric resulting in a permanent, high quality print which will not crack, fade or peel. This create a seamless graphic wall and the elasticity in the fabric ensures there is no creasing or sagging to worry about. Double sided graphics are available to ensure your marketing message is never missed. X-GLOO event tents provide a versatile display solution ideal for any business looking to take their brand to the next level. X-GLOO inflatable events tent's are among the handful of products that tick every box when it comes to exhibiting. The X GLOO uses German engineering to provide a superior quality event tent that has limitless customisation options. It comes in five sizes, meaning it is ideal for any area or space you might be exhibiting in- 3x3, 4x4, 5x5, 6x6 and 8x8. 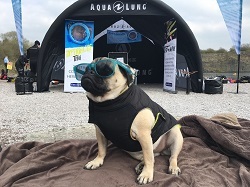 With a host of accessories available to add to your X GLOO, you can create a truly stunning and personal exhibition stand that is guaranteed to market your brand to its best potential. Offering limitless customisation and brand potential, the X-GLOO is a sturdy solution for any company looking for a striking and eye-catching presence at events. This inflatable tent is more than suitable for both indoor and outdoor occasions. The X-GLOO tents incorporate a robust building block system allowing for endless configurations. Some of the accessories that you can add include walls, canopies and even other X-GLOO tents using the linking tunnel. This allows you to create a completely bespoke structure. The twist flexible banner system is a sleek, stable and versatile design which allows you to use this banner system in any exhibition and display setting. It is the ultimate flexible display system. 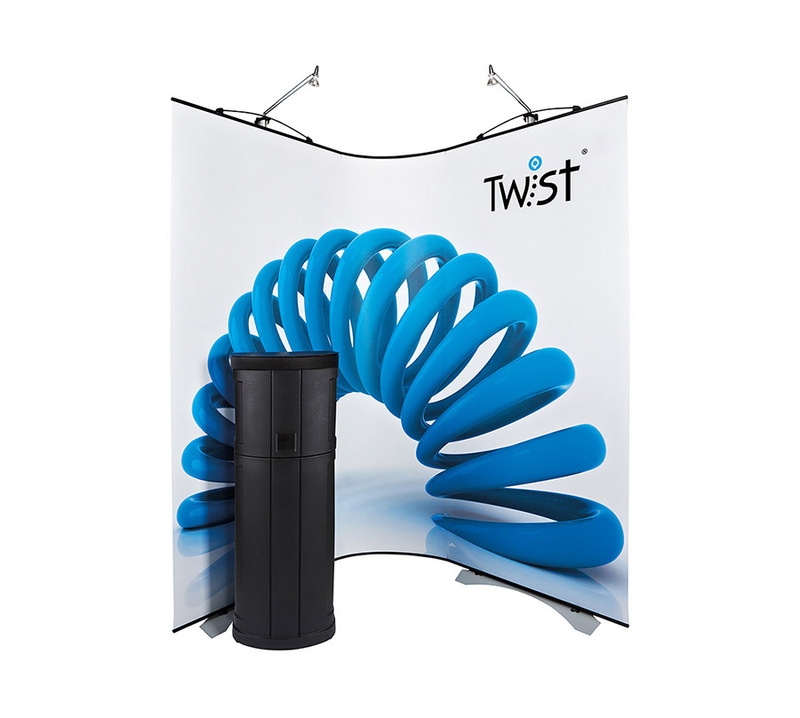 Twist banner's have a patented tensioning system to keep graphics taut. Individual banners can be used as standalone banners or can be joined to other Twist banners to create a bespoke exhibition stand to suit your needs. The Twist banner system is highly popular with businesses that plan to exhibit multiple times throughout the year. The twist system allows you to easily change your graphics which is perfect if your marketing message changes frequently. The twist modular display is available in a variety of sizes and configurations, including L-shape and U-shape exhibition stands. 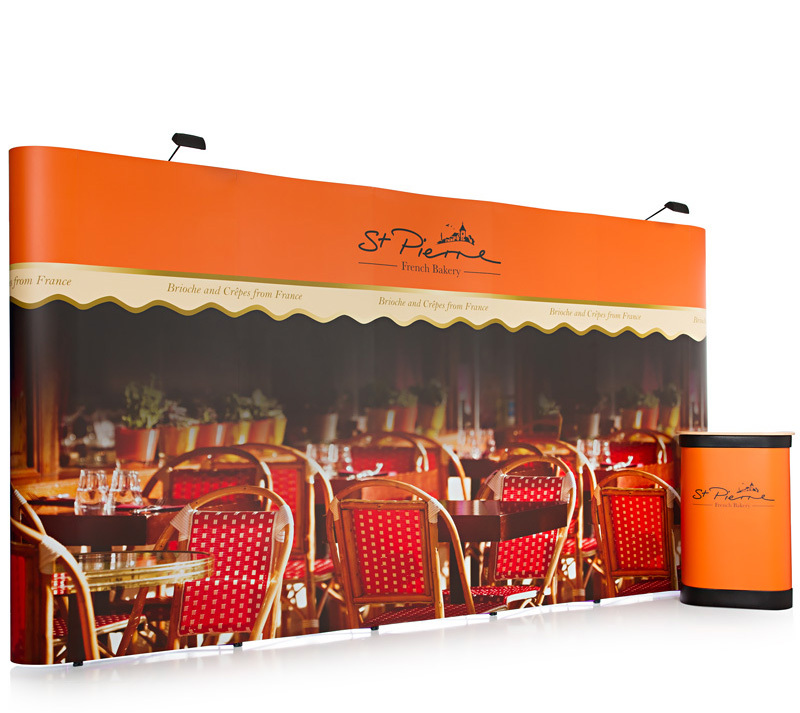 We also offer a range of accessories to complement the Twist banners including a shelf, portable counter and spotlight. If your requirement is for a modular display system you would like customised, the Linear Exhibition System makes an impressive statement. This system offers a whole host of accessories that will complement the display such as shelves, lights, literature holders, monitor brackets, etc. Using a range of aluminium profiles, you will be able to reconfigure your layout to ensure your display will fit nicely into any space. Available in a range of sizes and compositions- back wall, L-shape, U-shape, islands – the possibilities are endless. Linear exhibition systems are part of our modular display range which are the most flexible event systems available as you can add and take away elements from the display easily. This means that they are easy to link different components together to create a custom built stand. As for their portability, they can pack down into designed carrying cases, allowing for easy transportation and storage. The Signus ONE is a fully customisable inflatable brand pavilion which truly is eye catching. 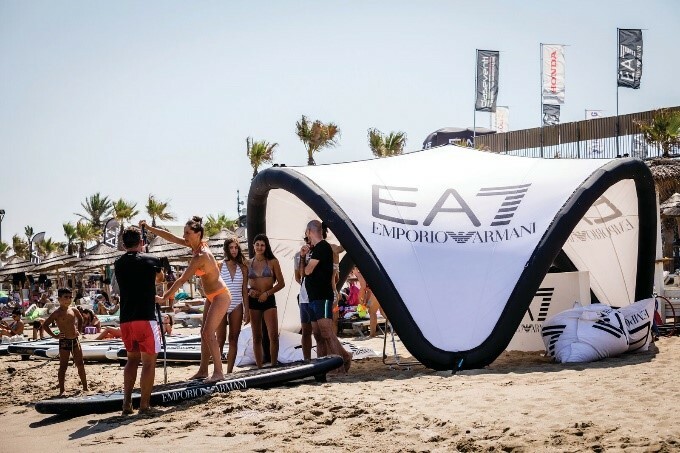 The inflatable marketing pavilion is an organic shape meaning that there is no other inflatable event tent like it on the market. The Signus ONE inflatable pavilion can be used both indoors and outdoors for all types of experiential marketing events. The impressive size and innovative design of Signus Inflatables UK offers your brand unlimited exposure with huge marketing potential. The Signus is ideal for promotional events and exhibitions including motor shows, motor forecourts and showrooms, sporting events and festivals. Effortlessly installed by one person in 10 minutes, the Signus tent is a no brainer. Available in three sizes – 4m, 5m and 6m. We offer a FREE 3D render of the Signus ONE, just send us your artwork and we will design your fully customised Signus marketing pavilion. No matter how big or small your allocated space is at an exhibition or trade fair, you can be sure that the visitors will make a bee-line for your sleek and beautiful display. The design of a stand can make or break your success at an exhibition and so it needs careful consideration. We have an in-house graphic design team, one of our designers can work with you to create a show-stopping visual display. Please contact us for more information on our exhibition stands or call us on 01733 5110303.